Hello everyone! I hope you are all doing well. Recently I’ve decided to update some of my old crochet patterns and give them a new look. I want them to be playful and fun, but at the same time, clear and easy to understand. The Orange Pumpkin pattern has a very special place in my heart. Let me tell you why. Sharing my crochet work online started with an Etsy shop. Back then there were only three or four patterns available in the shop. 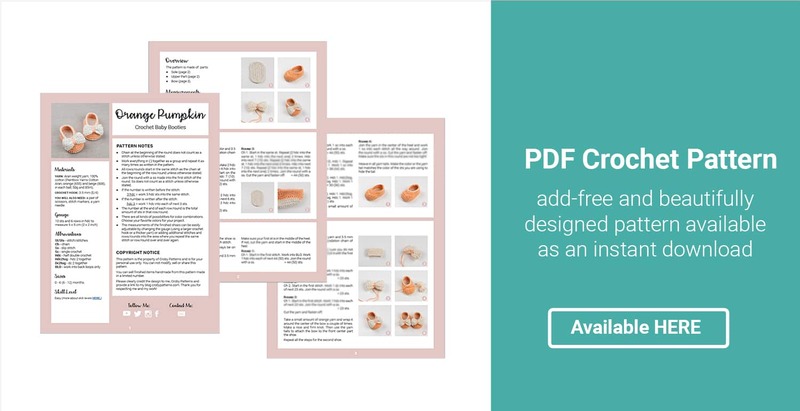 Today you can choose from more than 80 different crochet patterns. And they are not only patterns for crochet baby shoes, but you can find so much more; crochet rompers, hats, sweaters and cardigans too. I wanted to share my work with more people so I’ve started writing a blog. I gave it the same name as my shop, wrote a freebie and then we went live. 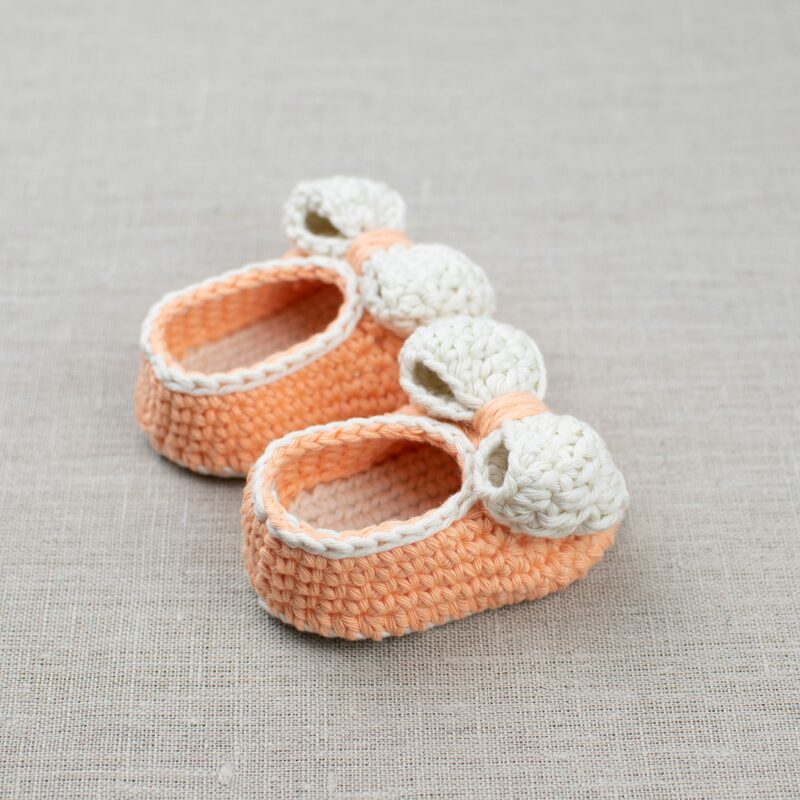 That very first post, the free pattern I’ve posted was my Orange Pumpkin crochet pattern for crochet baby booties. The chain at the beginning of the round/row does not count as a stitch unless otherwise stated in the pattern. The chain is just a way to give us to the proper height. The number of the chains at the beginning of the round/row matches the hight of the first stitch. Use stitch markers to mark your first stitch of each round/row. Gauge: 10 sts and 6 rows in HDC to measure 5 x 5 cm or (2 x 2 inches). 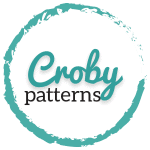 Pin the pattern HERE and help me share it with more crocheters! 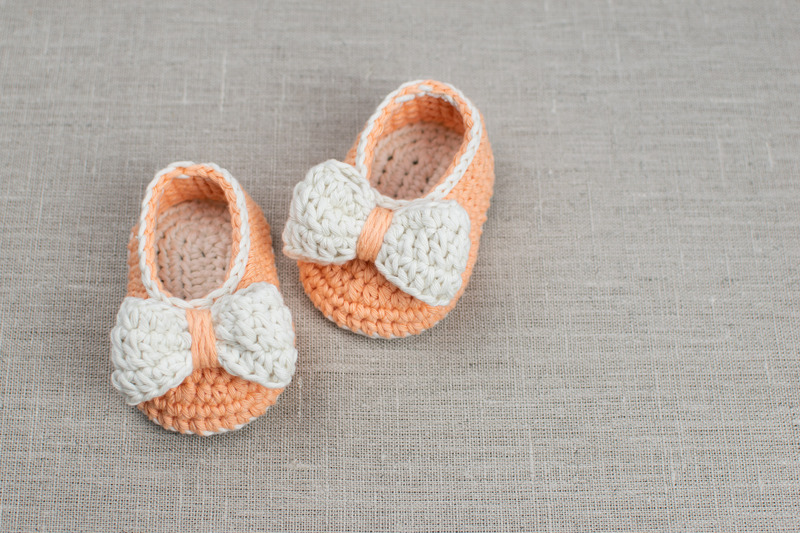 NOTE: This is an updated version of the Orange Pumpkin crochet baby booties pattern. All the changes were made in April 2018. Did you stay in the middle of the pattern right when I posted the updated version? No worries at all. You can find the old copy of the pattern HERE. The instructions are written as a combination of crochet pattern and collection of my notes, tips and tricks, actually everything I’ve learned during making this pattern. 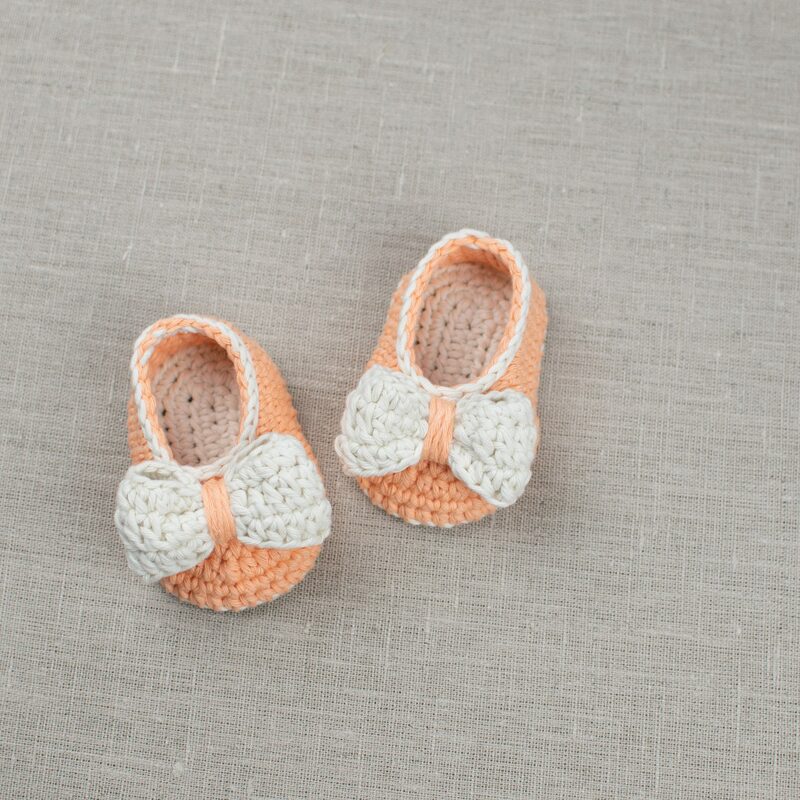 The Orange Pumpkin crochet baby shoes are made in three simple steps: the sole, upper part and the bow. Since the sole pattern for my baby shoes is almost always the same, I posted a video tutorial how to create a sole fo 0 – 6 months separate from the upper part of the shoe, so you can use it as a base for every Croby baby shoe pattern, not only Orange Pumpkin. You would not believe how much time did I save since I’ve posted that video tutorial. All you have to do now is, make soles than you can go through the archive of baby shoes and simply choose the upper part, follow the tutorial and that’s it. You can watch the video how to make a sole HERE. Now take some beige yarn and create a foundation chain of 10 chains. Turn and start in the 2nd ch from the hook. Work in rounds. After each round join the round with a ss. Round 1: 2 hdc into the same. Work 1 hdc into each of next 7. Work 6 hdc sts into the last chain. Now continue on the opposite side. Work 1 hdc into each of next 7 sts. 2 hdc into the last ch. Join with ss. = 24 sts. Round 2: Work 2 hdc into each of next 2. Hdc 7. Work 2 hdc into each of next 6 sts. Hdc 7. Work 2 hdc into each of next 2. make sure you skip the ss from the previous round and join this round with a new ss. = 34 sts. Round 3: This is our last round of the sole. Repeat (work 2 hdc into the first one, 1 hdc into the next) 2 times. Hdc 7. Repeat (work 2 hdc into the first one, 1 hdc into the next) 6 times. Hdc 7. Repeat (work 2 hdc into the first one, 1 hdc into the next) 2 times. = 44 sts. Cut the yarn and fasten off. You will need two, one for each shoe. When you are done continue with the upper part of the shoe. You can watch the video for the upper part and how to make a bow HERE. Take some orange yarn. The part of the sole where you finished your last stitch is the heel part. Fold the sole in half lengthwise. The stitch in the fold (heel) is the stitch where you will attach the yarn and start working on the upper part of the bootie. Work in rounds. Round 1: BLO! Ch 1. Start in the same. Work 1 hdc into each stitch all the way around. Ss. = 44 sts. Round 2: Ch 1. Start in the same. Work 1 sc into each of next 44 sts. Ss. = 44 sts. Round 3: Ch 1. Sc 10. Hdc 1. Repeat (join first two with a hdc2tog, work 1 hdc into each of next 2) 5 times. Hdc2tog. Hdc 1. Sc 10. Ss. = 38 sts. Round 4: Ch 1. Sc 10. Hdc 1. Hdc2tog. Repeat dc2tog 6 times. Hdc2tog. Hdc 1. Sc 10. Ss. = 30 sts. Round 5: Ch 1. Sc 9. Hdc 1. Hdc2tog. Repeat dc2tog 3 times. Hdc2tog. Hdc 1. Sc 9. Ss. = 25 sts. Cut the yarn and fasten off. Make your last round with the beige color. Round 6: Attach the yarn where you finished with the orange color and work 1 ss into each of next 25 sts. Make sure the slip stitches are not too tight! Join last the round with a ss made into the first one. Cut the yarn and fasten off. Repeat all the steps for the second shoe. Take some beige yarn and chain 20. Join the foundation chain with a ss to create a ring. make sure you do not twist the chain. Work in rounds. Round 1: Ch 1. Start in the same. Work 1 hdc into each of next 23 chains. Ss. = 23 sts. Round 2: Ch 2. Start in the same. Work 1 dc into each of next 23 sts. Ss. = 23 sts. Round 3: Ch 1. Work 1 hdc into each of next 23 sts. Ss. = 23 sts. Cu the yarn and fasten off. Hide all the tails. Take a small amount of orange yarn, wrap it around the middle of the main piece a couple of times. Make a firm knot to prevent the bow from falling apart. Do not cut the yarn ends just yet. Use them to attach the bow to the front part of the shoes. Repeat all the steps for the second shoe and you are done. Looooooove it! 🙂 But i want to make bigger booties- sole lenght about 12cm. Can you tell me how? 2) add a few stitches. Start in the chain. I have chain 11 for 0 – 3 months, this is 9 cm sole. Chain 12 is for the 3 – 6 month old babies is 9,5 cm, and chain 13 is for 6 -9 months babies. Sole size for them is 11 – 11,5 cm. As you can see it on the pattern there are parts of a row that are written in (). This are the parts where I enlarge size of shoe. So if you add one chain, you add two stitches in the next row, one on the right and one on the left side of a sole. I like All your patterns….I HD done the panda booties patten, came out nicely …. Thank you soooooo much for this tip, this helps me too…..
Hi, thank you very much for sharing. They are lovely! 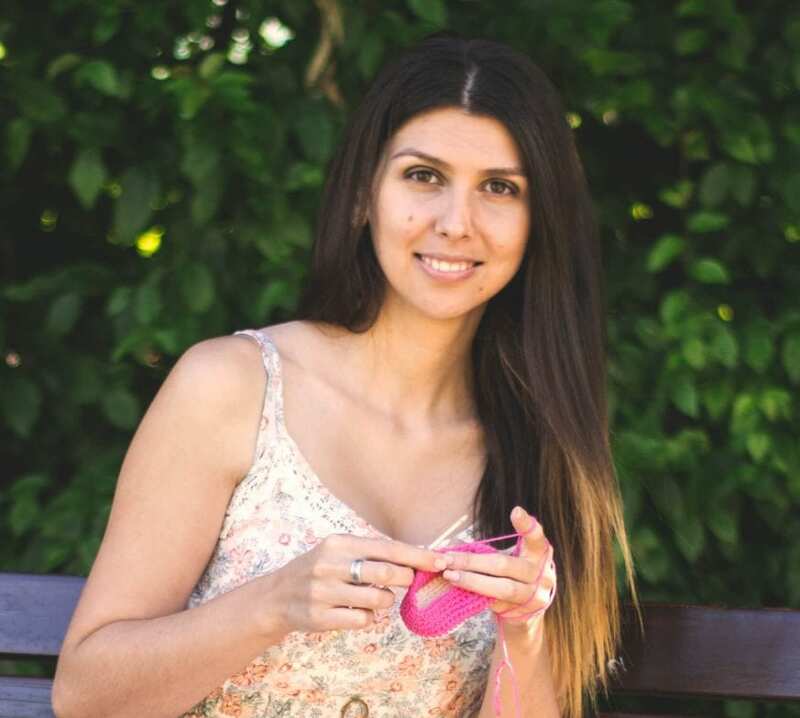 Thanks for sharing your crochet talent and pattern! All the photos are helpful as baby booties are sometimes very difficult for me to crochet:) Thanks again and happy crocheting! Thankyou very much. I am waiting for your new beauriful patterns! I am on my fourth try making these booties. When I get to round 3 of the upper part, things get really strange looking. In the middle of that round it says “repeat dc2tog 10 times”. Does that mean 10 times total or 10 additional to the first five? I’ve tried it both ways and ten total definitely looks better but after trying it both ways a my round doesn’t end where it should. Any advice?? This is the first time I see this blog and I want to thank you for your patterns and tutorials, they are beautiful and very well explained. I am trying to make this bow but am really confused with how it starts… It says Chain1. SC5. Turn. Can you explain this? Where am I supposed to be single crocheting into? BTW: I love your patterns, sooo cute! Yes, I can see the problem with the bow too. I was editing some pictures in Orange Pumpkin pattern post a few days ago and somehow by mistake deleted one line of the pattern. What is the brand of the yarn you used for these and how about how many yards does it take? I can’t find pumpkin in color. I love these exact colors especially for fall. I just wanted to thank you for sharing your crochet patterns. I am a long time crocheter and have just found out I will be a grandmother for the first time, a little girl. I have done blankets and have made the little flip flops, but this is my first venture doing booties and sweaters. Your bootie pattern is the easiest to follow. I have found a couple of sweaters that I would like to do, but the pinner doesn’t share her patterns. So thank you so very much. Thank you so much! This is big big gift for me ! These look lovely, can’t wait to give the pattern a try. Thank you so much for sharing this pattern and the clear photos. The little bow is so cute! My only wish is that the text/font on this page was in black. I find it very hard to read the gray text even if I enlarge the page a lot. Just me, I guess. do you have this pattern as a pdf i can purchase? its so much easier to take printed instructions around in my bag with me. Hi Darcie! No, not for this one. Sorry. Hello Doroteja! I want to thank you for sharing your talent with us. I’ve just finished to crochet one of these booties, and it turned out very pretty! It’s the first project I can manage to complete (I started crochet one month ago). Your patterns couldn’t be more clear, and your videos are super easy to follow! You’re definitely one of my favorite crochet bloggers. Thank you so much! Hi I love this pattern. Where could I find the same pattern but for a 12-16 month?